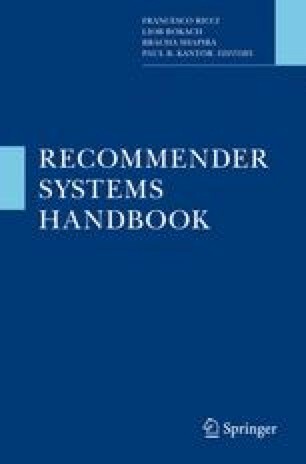 The collaborative filtering (CF) approach to recommenders has recently enjoyed much interest and progress. The fact that it played a central role within the recently completed Netflix competition has contributed to its popularity. This chapter surveys the recent progress in the field. Matrix factorization techniques, which became a first choice for implementing CF, are described together with recent innovations. We also describe several extensions that bring competitive accuracy into neighborhood methods, which used to dominate the field. The chapter demonstrates how to utilize temporal models and implicit feedback to extend models accuracy. In passing, we include detailed descriptions of some the central methods developed for tackling the challenge of the Netflix Prize competition. R. Bell and Y. Koren, “Scalable Collaborative Filtering with Jointly Derived Neighborhood Interpolation Weights”, IEEE International Conference on Data Mining (ICDM’07), pp. 43–52, © 2007 IEEE. Reprinted by permission. Bennet, J., and Lanning, S., “The Netflix Prize”, KDD Cup and Workshop, 2007. www.netflixprize.com. Funk, S., “Netflix Update: Try This At Home”, http://sifter.org/~simon/journal/20061211.html, 2006.